With final exams coming next week, students can bone up on studies, grab a free dinner in the J Cafeteria, and study alongside tutors as the fall semester winds to a close. Finals week at HSU offers plenty of study sessions and free pancakes. HSU’s Peer Health Educators host Mental Health Week in the lead up to finals. Under the theme of “Creature Comforts,” students can learn about self-care, reducing stress, make DIY tea blends and much more. All workshops are held in the Rec and Wellness Center drop-in lounge unless noted otherwise. Download a full schedule here (PDF). Finals week kicks off with movies and stress relief. On-campus residents are invited to a Movie Screening De-stresser on Saturday, Dec. 10 from 1 to 3:30 p.m. in the College Creek Community Center. The event will also include refreshments and small activities to help students unwind ahead of finals week. Students are encouraged to bring their own cups and plates to help minimize waste. 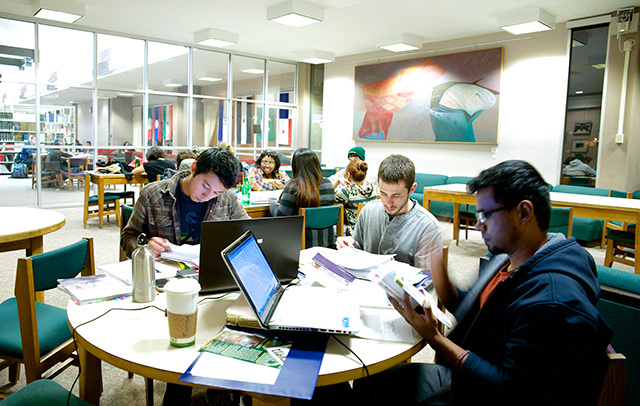 Campus residents can also drop by the Redwood Lounge on Sunday, Dec. 11, from 7 to 9 p.m. for a finals study session. Grab free refreshments and join study sessions at the AS Study Lounge on Sunday through Tuesday, Dec. 11-13. from 5 to 9 p.m. in the UC South Lounge. Tutors will be on hand to lead study sessions in Business Administration, Biology, Botany, Chemistry, Environmental Science, Geography, Geology, GSP, Math, Physics, Statistics, and Zoology. Download a full schedule here (PDF). On Monday, Dec. 12, students eat free from 8 to 10 p.m. at the 24th annual Pancake Dinner hosted by HSU faculty and staff. As always, the University Library offers extended hours beginning Wednesday, Dec. 7. Check the website for a full schedule, including hours for the Research Help Desk, periodicals, and more. Get the full schedule of Final Evaluation Week here (PDF). 7:30 a.m. to 1:45 a.m.
7:30 a.m. to 10:45 p.m.
10 a.m. to 10:45 p.m.
10 a.m. to 12:45 .m. 7:30 a.m. to 11:45 p.m.